This weekend my husband caught a bug so I took Emerson to a nearby strip mall to keep her entertained and have the house quiet so Karl could sleep. We grabbed a snack at Starbucks, went to say hi to the animals at PetSmart, and went into Old Navy. I only planned on checking out the clearance rack for Emerson, possibly grabbing a pair of shorts or pajamas, but we walked through the women's department and they had a table full of perfectly-heathered and worn vintage tees. While these shirts came in a variety of necklines, I was drawn to the v-neck. Without trying it on, I grabbed one in a heathered purpley blue (not online). I bought a Large; though the Medium may have worked, I figured such a tee would be better too large than too small. I got home, tried it on, and fell in love. The heathering is perfect – not too extreme, a true vintage look and feel. The shirt is soft and weathered, but completely opaque. the v-neck is deep enough to look feminine, but high enough to not expose too much. It's fitted, but not too fitted, the perfect length where you could tuck it in, or slouch it on the hips untucked. I had a hard time choosing a color as almost all of them look pretty darn fabulous and classic. This weekend I wore the tee with a pair of denim cutoffs, after washing and drying (it shrank only slightly but otherwise looks the same), I wore it again today untucked with white bootcut jeans, silver beaded necklaces and yellow heeled sandals. I can see wearing it with my Talbots Garden skirt and a wristful of colorful bangles, with a white blazer and distressed jeans, with a hot pink pleated skirt and a printed scarf at the throat. 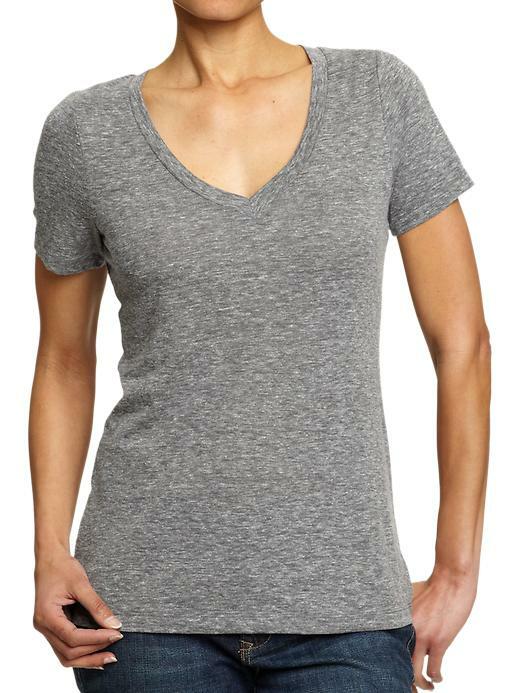 It's the type of tee that usually costs $80 at the department store, but right now at Old Navy it's on sale for $8.50. There are some negative reviews, so I believe that like other retailers, the quality is based upon the factory where the tee was made. I can recall when I worked for Express I preferred their Metro tees made in the Mariana Islands for they had the right weight and amount of stretch compared to supposedly the same tees made in other countries. The tee I am wearing and loving is made in Vietnam. When I find a budget-friendly fave, I just have to share it with you. The next time you visit Old Navy, check out their vintage v-neck tees – while the blue and medium gray are classics, don't discount the dark pink, light purple or yellow for a subtle pop of color that can dress up and down with ease and may possibly become your favorite tee in your wardrobe! I love v-neck t-shirts! They are very flattering on the body! I always browse through Old Navy. Their pants don’t fit me very well but I’ve had good luck with knits. I’m not surprised that you mention that the source of the item makes a difference. I’ve found their fit, even in the same style/item isn’t consistent. Why pay $50 for a t-shirt? THANK YOU! I have been bemoaning the loss of my perfect JCrew artist tees for some time now. Could these, maybe pretty please, actually be a substitute? I’ll be stopping by Old Navy ASAP. Thanks, Allie! I’ll give it a try! To reshape, best thing is to wash on gentle and then lie flat, block back to the correct shape. Future washings if you put in a lingerie bag and then lay flat to dry, it will keep its shape. Allie – I like it, too! One of the negative reviews gave me pause, though. It said the shirt loses its shape and becomes wider after laundering. I have had this happen before and with my shape, that is a disaster. It makes me look like Sponge Bob Square Pants! Do you know how to prevent this from happening? I’ll be sure to do so! sounds fabulous from your review! from reading reviews on the site, it seems that they get some pilling after a few wears and washes — would be interested to hear a follow-up review in a bit to see how yours holds up. Good to know! I have actually found a couple of good things there lately. I tend to order a bunch and return most of it but each time there are 1 or 2 things that I keep. Gotta love their free shipping and returns (even here in Canada which is unheard of). I will head there tomorrow with my 4 year old sidekick ! Sold! I need some (bigger…) t-shirts. Going to oldnavy.com now.